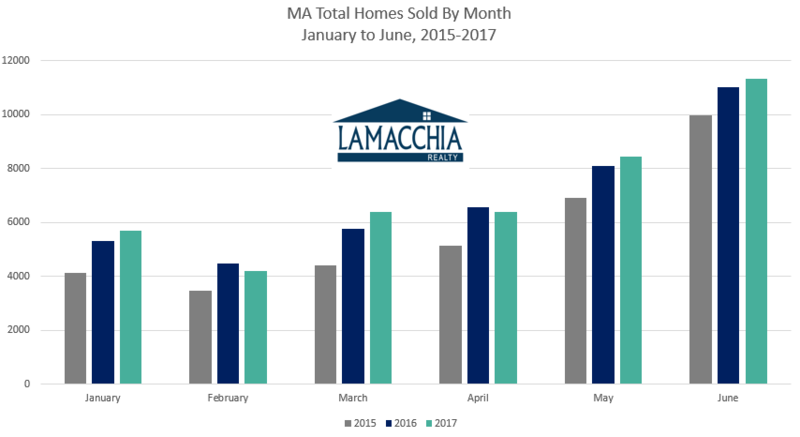 This Lamacchia Mid-Year Housing Report presents overall home sale statistics as of the first six months of 2017 compared to the same period, January 1st to June 30th, 2016. Highlighted in this report are the average sale prices for single-family, condominiums, and multi-family homes in Massachusetts and New Hampshire. 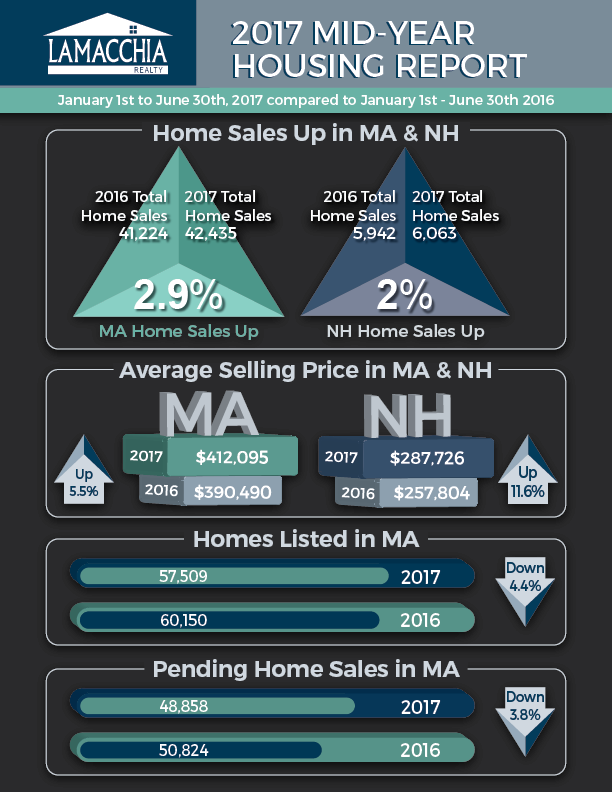 This year’s slight increase in total home sales for Massachusetts and New Hampshire compared to last year’s larger, more significant jumps are a result of the low inventory at the end of 2016 which continued throughout the first half of this year. The increase in average price for this year was also related to the low level of inventory, as many homes sold for over asking in multiple offer situations, which drove prices up. 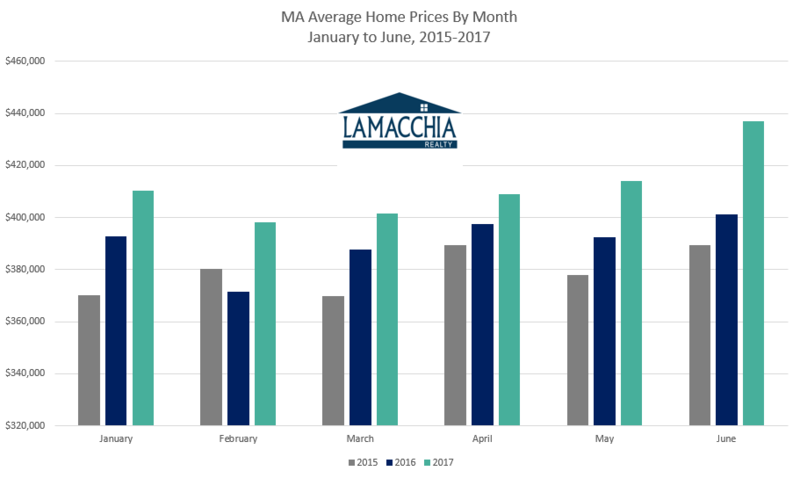 This year’s low inventory in Massachusetts lasted longer than we’re used to, as mentioned in our blog, Don’t Worry Buyers, Nothing Lasts Forever. Home-buyers experienced a frustrating winter, as many competed for homes that ended up selling in bidding wars, thereby driving the sale prices up. That lack of inventory that we saw in the first six months of this year directly correlates to 2017’s lackluster 2.9% increase in home sales, which is up from 41,224 in 2016 to 42,435 in 2017. This minor increase is a stark change from last year’s increase of almost 21%. The first six months displayed an up and down pattern with home sales: January was strong, February was down in every category, March increased, April fell, and then May was back up. June was the only outlier, remaining up over June 2016. Overall home prices increased by 5.5% from January 1st to June 30th with an average of $412,095 for singles, condo’s and multi family homes compared to $390,490 in the same period in 2016. This is a larger increase from the change we saw in 2016, which was only 3%. This increase isn’t surprising, as every month this year we’ve seen an increase in average home prices. As well, many homes sold for over asking in multiple offer situations in the first half of the year, which is often the case with a shorter supply of homes listed on the market. Overall home sales were up just 2% from January 1st to June 30th with 6,063 homes sold compared to 5,942 sold in 2016. Just like Massachusetts, this is a big difference from the larger 37% rise in we saw in the first half of 2016. 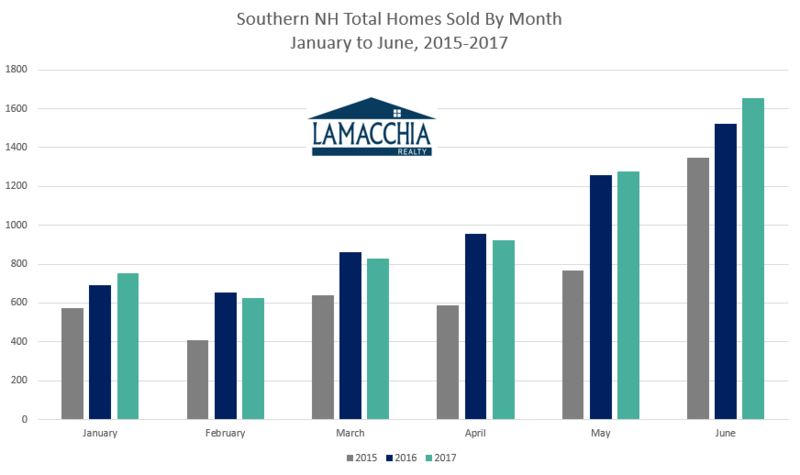 January of this year was the only month we saw an increase as large as 9% in home sales in NH, February, March, and April were down, May was back up slightly and June was up almost 9%. 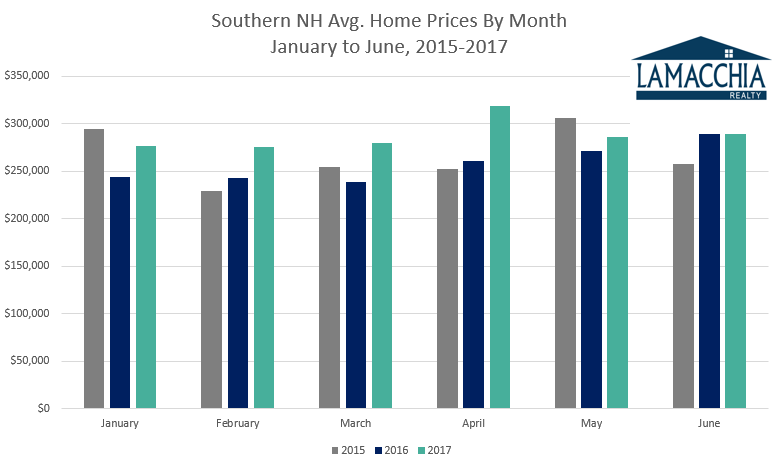 New Hampshire’s home prices rose a strong 11.6% with an average price of $287,726 compared to an average of $257,804 in 2016. The $30,000 jump in average price for homes is accounted for by the same situation we saw in Massachusetts. The sale prices were driven up by bidding wars as many buyers competed for the low number of homes available on the market. There were 60,150 homes listed for sale in the first six months of 2016 according to MLSPIN compared to 57,509 this year. That represents a 4.4% decrease in the number of homes listed. May was the first time this year we saw a strong increase in homes listed, 7.24%, although we saw a slight increase in January, every other month has been down including June. The best indicator of home sales to come is pending home sales. These numbers tell us total contracts accepted but not yet closed. From January 1st, 2017 to June 30th, 2017 there were contracts accepted on 48,858 homes compared to 50,824 in the same period in 2016. This represents a 3.8% decrease. This clearly indicates that the market has been affected by the lack of inventory and the rise in average price. Pending sales were down just under half a percent in June of this year, so it looks like the market will transition later than usual toward the buyer’s favor in 2017. Furthermore, from July 1st to July 15th, pending sales were down by 7.7% from 2016 at the same time. Again, this shows that buyers are now taking their time, as mentioned in Anthony’s most recent Market Report Video (click to watch), but it could also show that with inventory being lower than usual, buyers aren’t finding what they’re looking for at the prices they want. It’s been no surprise over the past couple of weeks, with the market slowing down since before the 4th of July, that pending sales month to date is down compared to last year. It was to be expected that the numbers would reflect this decrease especially when you take into consideration that at this time last year Brexit occurred, which caused a dramatic drop in interest rates in June and fueled a market race in July and August. Without that significant drop in rates this year, we aren’t going to see that jump in home sales in the months to come. Though we can expect to see the market pick back up in the next few weeks, there’s no real indication that August, September or October will result in any major increases in home sales. The rest of the year could remain a bit flat over last. Sellers at this point tend to have an over inflated notion of what their homes should sell for based on the fact that many homes have been selling for over asking in multiple offer bidding wars. As well, exhaustion is setting in for buyers and many realtors who’ve had to deal with multiple offers and the subsequent escalating home prices all spring. There is hope for buyers, however, because now is a much better time to buy than it was in the winter and spring. If you’re a buyer who took a break, you should consider getting back out there now.